We proudly introduce you to yet another pre-eminent speaker at YoastCon 2017: Marcus Tandler! Marcus, also known as Mediadonis, is co-founder and managing director at OnPage.org. This award-winning SaaS Tech-StartUp helps webmasters make better websites. Marcus started working in the SEO industry about 20 years ago, so he gained a lot of experience over the years. Read in this interview why you should not focus on Google or SEO when optimizing your site! Don’t want to miss ‘Mediadonis’ on stage? Get your ticket now for YoastCon 2017! You’ve been in the business for a very long time (since 1998). Do you think SEO changed a lot during this time? If so, what are the main lessons we can learn from those changes? When Google introduced its link-based ranking algorithm, the link spam games began. People were grabbing low hanging fruit via open guestbooks, forums and comments or simply buying links on high Pagerank domains. SEOs were addicted to Pagerank. For a long time acquiring links was pretty much the only thing you’d have to worry about when trying to rank a website for juicy keywords. Brand and authority have continued to become more important throughout the years, which all started with Google’s Vince update in 2009. On-page SEO and UX have become more important as well, with Google becoming less dependent on ranking signals which can be gamed from the outside, like backlinks. Google’s goal is to create happy users. Google has become exceptional in anticipating search intent and delivering a satisfying result. Of course, those are not all ranking experiments. Google famously tested 42 different shades of blue to find the optimal blue for their search result links. You must have seen lots of websites in your career. What’s the biggest mistake you think website owners make when it comes to SEO? Often people think of SEO as a tactical approach, which gets applied only after the website is up and running. It makes a lot of sense to include an SEOs opinion right from the start when conceptualizing the website or planning a relaunch. The biggest mistake I see quite a lot is failing at indexation control and poor crawl budget management. Most webmasters are feeding Google all available pages, not thinking about whether Google should index those pages. For example, online shops with x different color variations of the same product on x different pages. Same goes for feeding a blog’s category- and/or tag-pages to Google, while most of the time these pages cannibalize other pages from the blog and provide a subpar result for the user. So basically compulsive hoarding of pages. Ever since Google introduced the Panda, webmasters should try to cut the fat, only feeding pages to Google which provide value to a potential searcher. Do I need it for my users? Does it need to be indexed? Does it need to rank? Although Google has almost limitless crawl capabilities, they still want to manage it most effectively. It’s all about avoiding waste of resources. Don’t become a digital compulsive hoarder. As the co-founder of OnPage.org, the SEO tool that analyzes all kinds of on-page elements that influence your ranking, do you believe focusing on on-page SEO is the best SEO strategy? Absolutely! Of course, you will need a couple of good links to convince Google of your site’s legitimacy and get a shot at the top 10, but only thorough on-page SEO will make your site stay there. On-page SEO is the foundation. Your ambition should be creating a 100% perfect website. Fast loading, omni-device friendly, no broken links, broken assets or anything else that can go wrong. There are also various best practices for international websites (hreflang), handling internal duplicate content (canonical), pagination issues (rel prev / next) as well as controlling indexation with the help of robots.txt directives or the noindex-tag. The better Google can understand your website structure and content, the better you will end up ranking. I’d aim much higher, though. Not focusing specifically on SEO but rather website quality and user experience as a whole. Users want fast loading websites that work properly on all desktop and mobile devices. Of course, Google also likes fast loading websites, because it makes their users happy. So Google should not be your focus, always focus on the user, and you’ll be fine. SEO of the future: what should website owners focus on if they want to rank now AND in the future? Are there any important changes coming up that we should know about? If you focus on your users, you will be fine and won’t have to worry all too much about potential updates and changes. Google cares a lot about its users, so you should, too. Google is getting better and better at determining which result is the best result for the user, so you should always aim at being the best possible resource for the keywords and topics you’re trying to rank for. It helps to be honest with yourself up front, so is your website a good resource for these keywords and topics? Do you offer anything unique over the websites which are already ranking in the top 10? Constantly ask yourself: If your website would disappear from the web, would anyone miss it? Why shouldn’t people miss your talk at YoastCon? 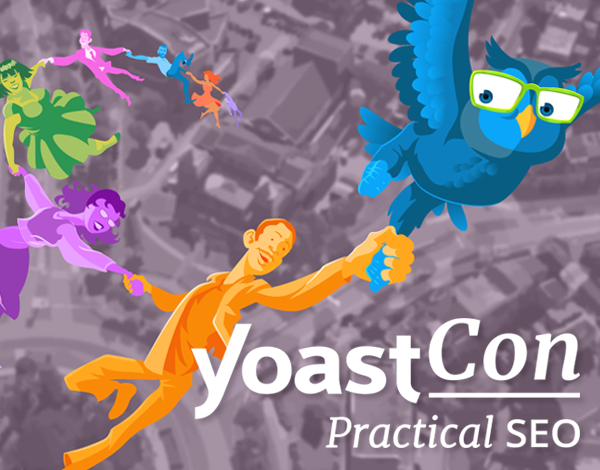 Get your ticket now for YoastCon 2017!